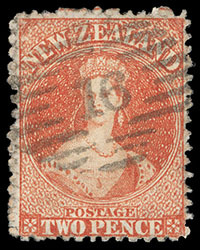 New Zealand, 1872, Queen Victoria "Chalon Head", 2d vermilion, perf 12½, Lozenges watermark, exceptionally well centered with large margins, strong color and impression on bright paper, neatly cancelled by central strikes of numeral "16" barred oval of Port Victoria, an Extremely Fine gem. Scott No. 50. Campbell Paterson No. A2x. SG No. 142 £500 ($660). 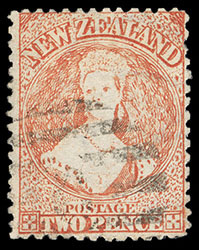 New Zealand, 1872, Queen Victoria "Chalon Head", 2d vermilion, perf 12½, Lozenges & "Invicta" watermark, Plate blotch under "C" of "PENCE" (R. 14/11), well centered with strong color, sharp strike of "5" medium barred oval, Very Fine and scarce. Scott No. 50. Campbell Paterson No. A2x. 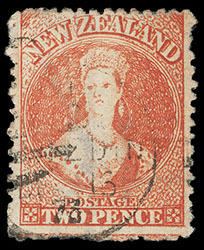 New Zealand, 1872, Queen Victoria "Chalon Head", 2d vermilion, perf 12½, preprint paper fold, Lozenges watermark, position R. 20/5, strong bright color and paper, partial strikes of circular barred cancel, F.-V.F. 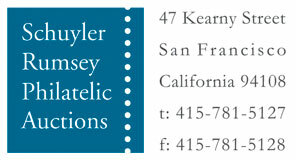 and scarce printing variety. Scott No. 50 var. Campbell Paterson No. A2x. SG No. 142 var. £500 ($660). 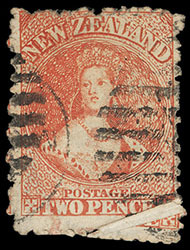 New Zealand, 1872, Queen Victoria "Chalon Head", 2d vermilion, perf 12½, Lozenges watermark, deep rich color, tied by "C" barred circle cancel duplexed with "N.Z., Christchurch, DE 9 73" cds on light rose buff cover to Wellington, endorsed "Per Omeo" at top left, reverse with Wellington (12.10) arrival stamp, Very Fine and rare use, Spink, Dec 15, 2004, lot 868. Scott No. 50. Campbell Paterson No. A2x. SG No. 142 Estimate $1,000 - 1,500. ONE OF ONLY A FEW RECORDED USAGES BEARING THE 1872 2D VERMILION WITH LOZENGES WATERMARK. References: Illustrated in Odenweller as fig. 13.4, p. 175. 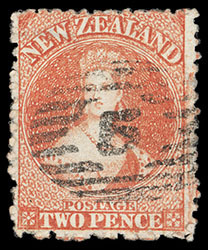 New Zealand, 1872, Queen Victoria "Chalon Head", 2d vermilion, retouched, perf 12½, showing "c" of "Invicta" watermark, pos. R. 18/4, exceptionally well centered with bright color, light strike of letter "C" thick barred oval, showing "C" of "Invicta" watermark, Extremely Fine and choice, Bernard Symonds, Spink, July 2007, lot 1451. Scott No. 50 var. Campbell Paterson No. A2x (Y). SG No. 142a £750 ($980). New Zealand, 1872, Queen Victoria "Chalon Head", 2d vermilion, retouched, perf 12½, Lozenges watermark, showing Lozenges & "I" of "Invicta" watermark, Diagonal scratch across "D" of ZEALAND (R/ 17/10), nicely centered with strong color, light Dunedin cancels, fresh and Very Fine. Scott No. 50 var. Campbell Paterson No. A2x (Y).